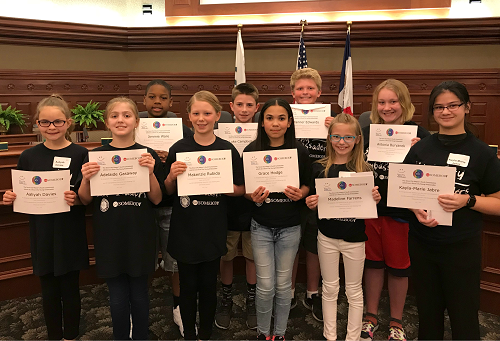 The Sioux City Mayor’s Youth Commission’s accepts applications for its Young Ambassadors program in March. This program honors students who have displayed good character and/or exceptional leadership inside or outside of the classroom. All nominated students will receive a free Young Ambassadors t-shirt, gifts from area businesses, and public recognition at a ceremony the first Monday in May at 7 p.m. at City Hall. From the nominations, 10 students will be selected to be mentored by members of the Sioux City Mayor’s Youth Commission. To be eligible, the student must be in 4th-7th grade, enrolled in a Sioux City public or parochial school, reside in Sioux City but attend a school outside of Sioux City, or be home schooled in Sioux City. To submit an application, please click here: https://www.surveymonkey.com/r/P38KDJG. Nomination deadline is March 29, 2019. Please direct questions to siouxcitymyc@gmail.com or siouxlandcaresdirector@gmail.com. This program is a partnership between the City of Sioux City, Sioux City Mayor’s Youth Commission, and Siouxland CARES.